In today’s highly competitive world it has become imperative for businesses to enable E-commerce and customer interfacing systems to ensure 24×7 availability and a seamless consistent experience for the new breed of Omni-channel customers. OdiTek’s expertise in a broad spectrum of E-commerce technologies has enabled our customers to stay ahead of the curve. Effective Quality Engineering and Assurance of Enterprise E-commerce applications often requires specialist knowledge of commerce products, underlying business processes and testing best practices. Happiest Minds testing practice brings all three elements together to provide a specialized and holistic approach for B2B and B2C e-commerce applications. We provide an extensive range of Quality Assurance and Quality Engineering Services, ranging from E-commerce application implementation validation to Business As Usual (BAU) support for testing. 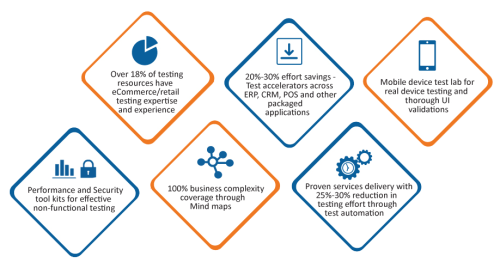 OdiTek accelerators like E-commerce centric testing approaches, selenium based hybrid automation framework for the web, mobile and open source based performance testing solutions help customers introduce efficiencies and save time across the software testing life cycle. A Process Assessment and Test Planning Services – to help build the basic foundation of high quality E-commerce deployments. We custom build this based upon business imperatives, technical stack (Magento, Hybris, etc.) and customer context. Tool Assessment, Integration and Implementation – Specific to different areas of testing including test automation, performance testing, test management, test data and environment management and QA reporting. E-commerce Implementation Validation Services – These services include end to end testing of the functionality, integration, security, performance and extensions of the solution. OdiTek’s testing services has deep testing expertise through our E-commerce domain knowledge, experience and technical proficiencies. Our career test consultants bring in the independent verification and validation perspective. We have significant experience in areas of test optimization such as test automation, test frameworks and non-functional requirements validation that are critical to high quality E-commerce deployments. Our test accelerators such as Selenium Based Open Source Test Automation Framework, API Test Automation Framework and Performance Testing Framework help compress the test life cycle significantly. Additional benefits can be gained through our robust QA metrics, dashboards and QA cockpit views so that accurate release decisions can be made. We strategize test implementation, with qualitative tools and perform software testing by identifying test scenarios using frameworks. We provide end-to-end security testing solutions to protect customer's data. We easily identify response time, resource utilization and reliability of numerous real time applications by performing various types of testing such as Endurance testing, Failover testing, Performance modelling, etc. Test Automation Engineering – Framework design & development, library and script design, automated execution suites, suite maintenance and upgrades. Test Strategy and Planning – Business goal specific test strategy design and planning. The service is typically tailored to the development model of choice – waterfall, iterative, agile or spiral. Application Specific Tool Assessment – Based upon the E-commerce platform’s technical stack, we help with deep assessment of toolsets that can help accelerate and increase effectiveness of the assurance process. Mobility Testing – We offer highly advanced testing services to assure E-commerce implementations involving mobile deployments including testing of native, hybrid and responsive mobile applications. This includes compatibility and device specific testing as required. Performance Testing and Engineering – Our E-commerce Testing strategy includes performance testing (using open source/COTS toolsets) tailored to the specific workload characteristics of the E-commerce implementation. We also offer bespoke performance exercises for contextual needs – such as seasonal load fluctuations (Black Friday, etc.) or upgrades/modifications.